Each fall, as October approaches, horse show barns often host equestrian Halloween fun shows, Halloween horse parades, Halloween fall festivals, Halloween barn parties or other autumn horsey event. Many horse lovers enjoy dressing up in Halloween and themed costumes for such happenings, and some even decorate or costuming their horses. How can you design a delightful Halloween or themed costume for your horse? Here are several helpful and practical pointers, including many simple Halloween horse costume ideas. The Halloween horse costume must be designed with safety in mind. As fright-or-flight creatures, horses are easily startled. Nothing can ruin a Halloween horsey event like a panicked horse. When horses become frightened, the hooves fly, the horses bolt, and people tend to get hurt. Streamers, crinkly materials, sequins and shiny objects, tin foil, flashing lights, fluttering feathers, clinking beads and jingling bells can terrify a horse. All of these tend to be extremely unpractical and poor choices for a Halloween horse costume. When dressing up a horse for Halloween, keep it simple for the horse. This is a brilliant example of a good costume, one that a horse is comfortable wearing and will not hinder movement, or disturb with fussy, noisy details around the eyes, ears, mouth, legs or tail. In addition, horses seem to universally object to wearing items on their faces or about their ears. 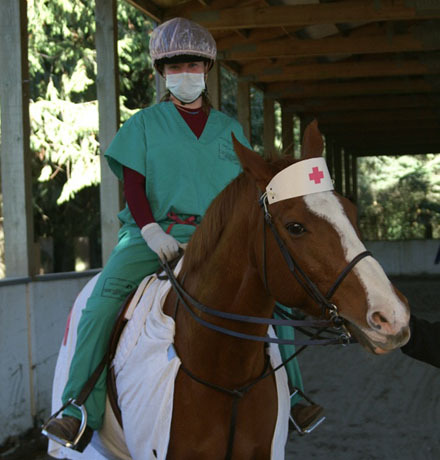 Masks, hats and facial adornments are generally rejected by horses. This is a fun look costume and the horse does not seem to mind the headpiece. Know your horse and dress him up accordingly. Because of these equine concerns, a Halloween horse costume must be creatively designed, with an aim towards simplicity and utility. Kudos. This is a terrific way to dress your horse for Halloween says The Horse Fund. If the horse does not mind the cap then this is another fab Halloween look for you and your horse.